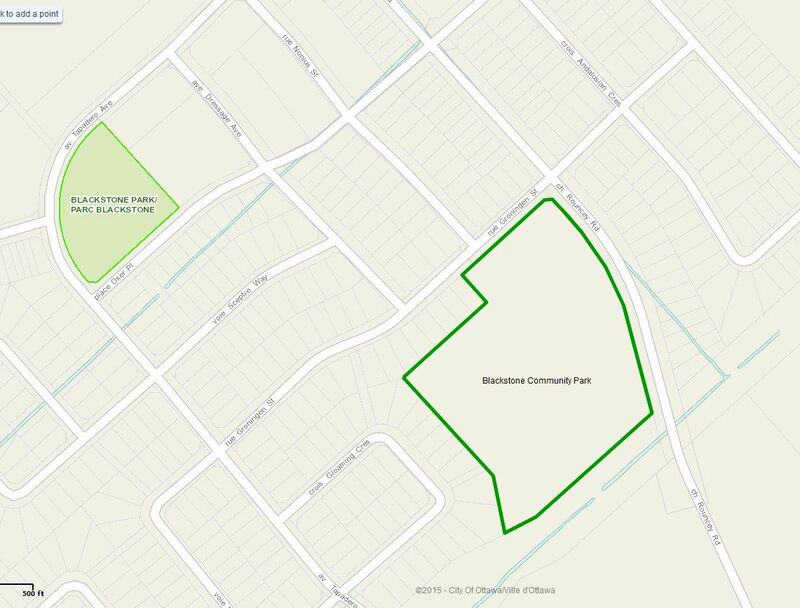 The large community park in Blackstone will be 3.25 hectares (8 acres +/-) and will service a large area of the Fernbank community and will be located southwest of the intersection of Rouncey Road and Groningen Street as shown in the attached map. The Fernbank Community is considered to encompass the entire development of land in this area which is all part of the Fernbank Community Design Plan. The park will be constructed by the developers and the trigger for the park to be built is 50% of the building permits for the area it services. This community park serves both the Blackstone and Fernbank Crossing (Regional Group) developments. The total combined unit total is 2,800 (+/-). Mattamy Homes is going to confirm the building permit numbers that we are at now, however, between themselves and the Regional Group buildings it was estimated they are at about 500 to 600. Therefore the estimated timeline as to when we will see this park getting built will be in 2-3 years at the earliest. It was also noted that the City is considering the addition of a community sized skateboard park in this park, however this would require removal of one of the other components within this park as it must stay within the target budget for the park. There are a number of parks planned for the Fernbank Community and the general locations of these parks were identified in the Fernbank Community Design Plan, you can view the park locations on the Fernbank CDP Demonstration Plan. In addition to Neighbourhood and Community Sized Parks there is also a District Park planned which will be a larger recreation complex with indoor facilities. The development of these additional parks are tied to the development as it progresses in this area and at this time I do not have any firm timelines.